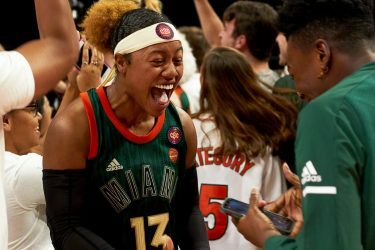 After a 69-62 opening-round victory against 13-seed Florida Gulf Coast, the Miami Hurricanes look to advance to their first Sweet 16 under Katie Meier on Sunday against the Arizona State Sun Devils. The Sun Devils comfortably defeated 12-seed University of Central Florida 60-45 on Friday. Courtney Ekmark led the way with 20 points. ASU is a strong defensive unit, allowing only 58.2 points per contest against a tough Pacific Coast Conference-12 schedule that featured four teams, which claimed top-four seeds in the tournament. The Sun Devils are one of the sharpest offensive outfits in the country, led by junior Reili Richardson’s 4.8 assists per game. The Hurricanes might not be able to get a lot of live-ball turnovers, so they’ll have to be efficient in the half court to make up for fewer transition opportunities. Senior Emese Hof will need to improve on a first-round performance in which she shot only 4-of-11 from the field and made just two trips to the free throw line. Miami will need Hof to bounce back in order to advance. In addition to Ekmark, a former national champion at Connecticut, who averages 10.5 points per game, the Hurricanes will have to contend with forward Kianna Ibis. Ibis leads the Sun Devils with 14.2 points, adding 6.6 rebounds as well, and she’ll have to work on defense to contain Miami’s duo of Hof and Beatrice Mompremier. The pair each had a double-double against FGCU. It’s a short turnaround for both teams, and the coaches and players have done a lot of cramming in the past 24 hours in preparation for Sunday’s game. Both sides insist that they did not look ahead in planning for this game, so coaches and players will be hard at work in the lead-up to their biggest game of the season. 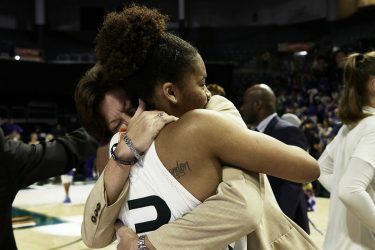 Beyond being a huge individual milestone for Meier, advancing to her first career Sweet 16 would give her more time with a team that has grown to be one of her personal favorites. 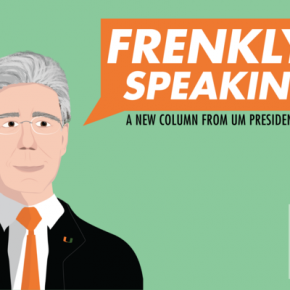 It has truly been a special season for the Miami Hurricanes, and it feels like it has all been leading to a remarkable accomplishment. Miami will get it done and move on to Portland, Oregon for the Sweet 16.